NEW BRITAIN - A new retail company in the city opened its doors to the public earlier this month. Coach Carter’s Apparel, located at 18 Main St., had its grand opening June 4. It is owned by Jerry Carter, who used to offer the same services from his basement, but he decided to open a shop when his business grew. Coach Carter’s Apparel sells, designs and makes customized t-shirts and uniforms, mostly for sports teams. The store also customizes nursing scrubs, and school uniforms. The custom apparel offered at the shop includes tees, polos, hoodies, yoga pants, shorts, hats, tanks and jerseys. Store customers must select the garment, then they can pick a design, and customize the style. Carter started his business from home in 2014. However, this year things changed. 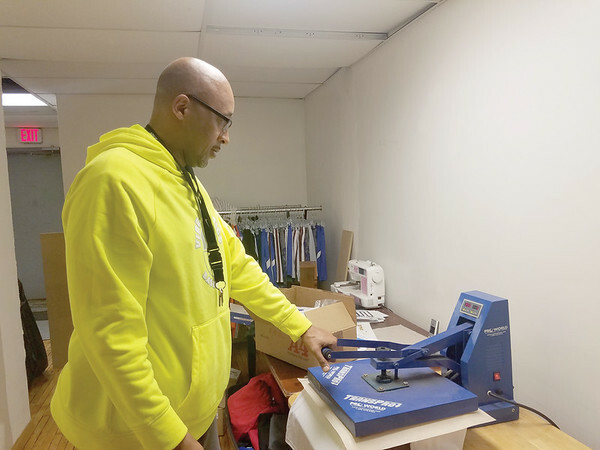 “I started making more uniforms, I started getting more business, that’s when I said to myself it’s time to open your own store,” Carter said. Carter said that one day he drove by the space where his store is now, and realized it was being leased. “When I found this location it was perfect,” Carter said. He added that the building was in good shape, and that it didn’t need many renovations. In addition, Carter told The Herald that when he was a child, the same space was used for the same purposes. It was a store called Hadfields Sports Shop. “It was right here in the same exact spot,” Carter said. Carter said his goal is to be the number one custom and sports apparel business in New Britain. “I want to touch base with every company, every family in the City, and do their custom T-shirts,” Carter said. Carter is the president of a non-profit organization called Vibe Athletics, which promotes basketball leagues for youth. Carter plans to hire some of the teens involved in Vibe Athletics to work at Coach Carter’s Apparel. Coach Carter’s Apparel is open Monday through Friday 11:00 a.m. to 6:00 p.m. and on Saturdays 9:00 a.m. to 1:00 p.m. The store can be reached at 860-259-3190 or coachcartersapparel@gmail.com. Posted in New Britain Herald, Business, General News on Friday, 15 June 2018 21:13. Updated: Monday, 18 June 2018 10:13.